"I don't want any Indian food nor other Asian food for all that matters", exclaimed Fussy Boy. "Uh, we're in Surrey you know...", I replied. The only choices we had were the chain restaurants and honestly, that wasn't really in the cards. What to do now? Well, we had to drive over the Patullo Bridge to find that non-Asian, non-chain restaurant that he was looking for. Oh, to complicate things even more, it had to be reasonably-priced as well. One more thing, it was snowing too. Thank goodness I drove the SUV. Where did we end up? At a completely random place called Gino's. 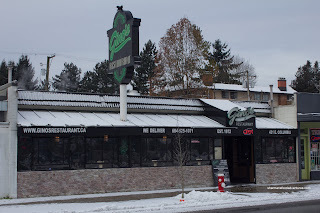 If I had to describe the place, it is in the same ilk of a Gigi's or Neighbour's. 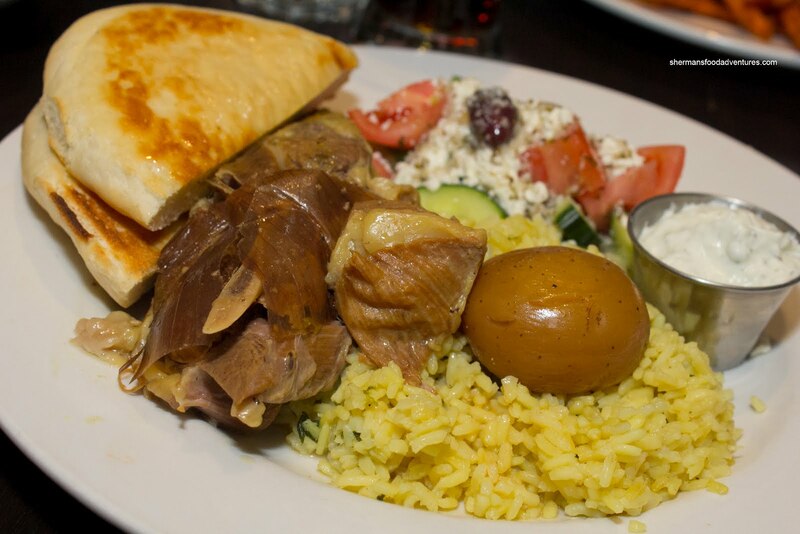 You know, a little bit of Greek, a bit of Italian and some North American food to boot. That was partly what drew us to the place since we needed variety. Fussy Boy went for the Greek food in the Beef Souvlaki. This was a neatly constructed plate of food as evidenced in the picture. The beef was slightly chewy, yet not overly so. It was grilled with a nice char which looked good and provided some smokiness. The rice was rice where it wasn't mushy and the Greek salad was vibrant and fresh. There was just enough dressing on top to provide the acidity and olive oil to go with the feta and dry herbs. Although the potato was not of the roasted lemon variety, it was perfectly textured being soft while retaining its shape. For myself, I went for my standby in the Roast Lamb. It was a fairly decent portion considering the price. I found it very moist and tender with only some parts of the exterior being dry. The meat was well-seasoned with hits of garlic. 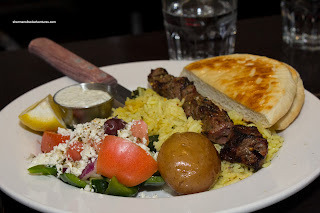 Similarly to the souvlaki, the other items on the plate were good. I liked the tzatziki as it was thick with plenty of cucumber. 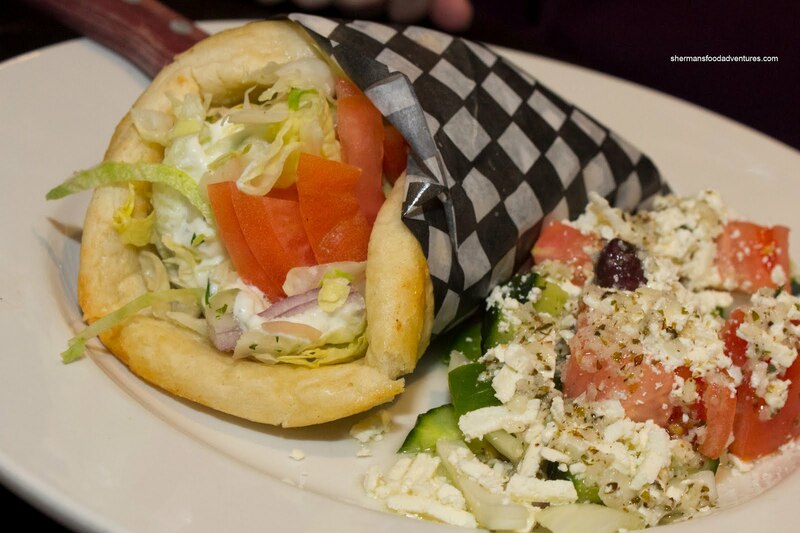 Mrs. Spray Bottle went for the Gyro which arrived stuffed with tender beef and lamb, shredded lettuce, red onions, tomatoes and tzatziki in a warm pita. She enjoyed this very much since the pita was soft while the ingredients were fresh. The meat was flavourful and when combined with the thick tzatziki, there was a good balance of textures. 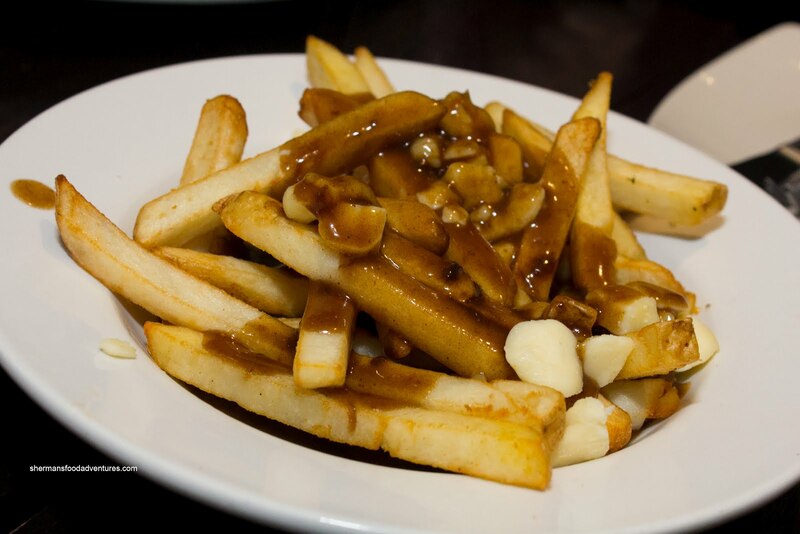 Rather than the regular side of fries, she opted to substitute with a Poutine. Although the gravy was rich and flavourful without being salty, the generic fries didn't do it for us. If they had used fresh cut fries, it would've been better. Furthermore, the cheese curds were of the soft mushy type rather than the more desirable "squeaky" ones. Lastly, Immature Girl had the Veggie Burger. Yes, the veggie burger. I'm not trying to hate on veggie burgers, but for restaurants that don't feature a diverse vegetarian menu, it can be an iffy experience. 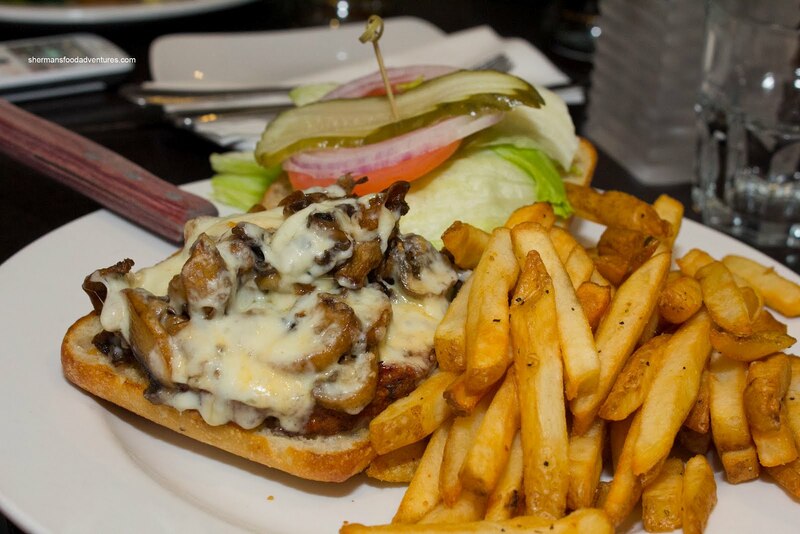 Whatever the case, they did their best to spruce up the vegetarian patty with plenty of mushrooms and cheese. The result was a surprisingly tasty burger. She didn't miss the meat and there was no absence of flavour. For what it's worth, Gino's is not a fine dining establishment. As such, the food should be judged fairly. For us, the prices were more than reasonable for the amount of grub on the plate. Furthermore, the food was above-average for this class of restaurant. 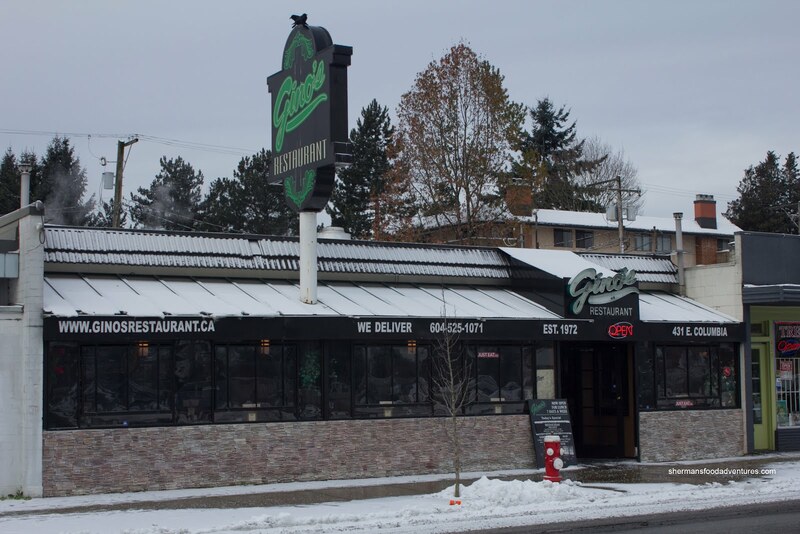 Combined with friendly service and a decently comfortable dining space, it ain't a bad choice to grab a bit in the area.